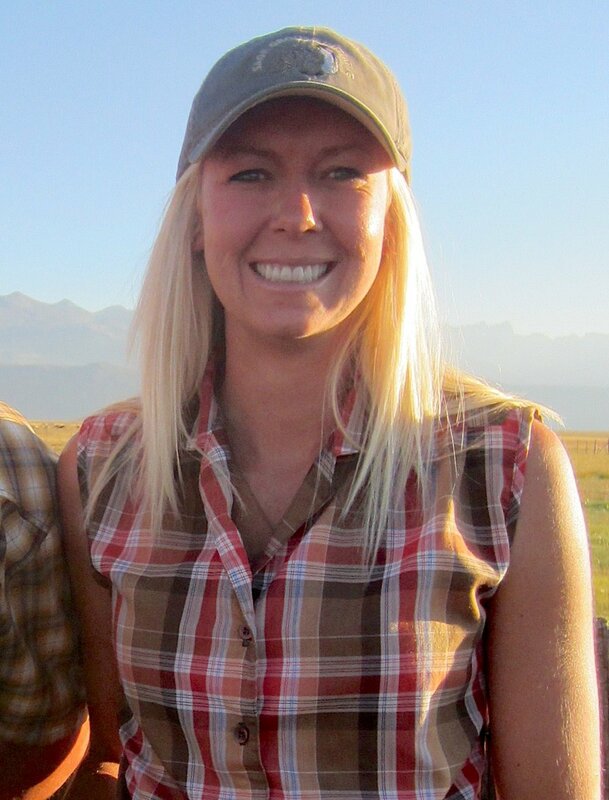 The following article is contributed by Mandi Hirsch with the Sage Grouse Initiative. Due to Hirsch’s cross-boundary work on both private and public lands, her position is supported in part by the Partnering to Conserve Sagebrush Rangelands effort between the Bureau of Land Management, Intermountain West Joint Venture, and SGI. Over the past six years, I’ve been working as a Rangeland and Wildlife Conservationist for the USDA Natural Resources Conservation Service (NRCS)-led Sage Grouse Initiative (SGI). My position entails teaming up with local landowners and partners to implement conservation practices to address resource concerns that benefit rangelands, wildlife habitat, and livestock operations. Since lands managed by the Bureau of Land Management (BLM) are an integral part of many Wyoming ranching operations in this area, it seemed only logical for ranchers/lessees to implement cooperative conservation practices across ownership boundaries. This cooperation not only benefits ranching operations but the entire landscape. These unprecedented working land partnerships have made landscape-scale conservation a reality here in Wyoming. Since 2013 we have implemented SGI prescribed grazing plans and associated conservation practices on approximately 407,000 acres! Of those acres, approximately 314,000 acres are BLM managed lands, 29,000 acres are state-owned lands, and 64,000 acres are privately owned lands. Here, I'm working with a Range Conservationist from the BLM and a rancher to monitor range health on public land enrolled in an SGI/BLM grazing plan. Photo by Ivan Laird. I work closely with landowners and BLM staff to modify grazing plans to address threats to sage grouse habitat and to improve overall rangeland function and condition. The conservation and grazing plans are complicated and we must work cooperatively to ensure they satisfy the landowner goals and objectives and guarantee compliance with BLM permits, rules, and regulations, all while staying within the parameters of the SGI program. Improving natural resources across ownership boundaries have been made possible due to the willingness of BLM staff and landowners to work collaboratively together with NRCS. One progressive project was on a ranch that covers nearly 94,000 acres of private, state and BLM lands. This area, like many others across the West, faces severe droughts, riparian and rangeland condition issues and management dilemmas. The pastures on this ranch are approximately 20,000-30,000 acres with very little interior fencing. Together, the producer, BLM staff, and I designed a grazing system in which no additional fencing was needed. Using the existing ample water infrastructure and herding, we composed a five-pasture rotation with the option to rest one pasture a year. To implement the grazing plan, we set up a system to gradually turn on and off the water at the stock tanks to encourage the livestock to drift from one pasture to the next over the course of the grazing season. Due to the success of the project, the BLM and landowner plan to mimic portions of the SGI grazing plan into the future, adopting it as a long-term strategy for the ranch operation. These happy cows like their healthy rangelands! Photo by Steve Garland. A second project, not too far away, is on an 84,000-acre mixed ownership ranch operation. In this instance, project complexity came in the form of one owner/operator single-handedly operating three separate ranch properties separated by over 15 miles. The operation includes vast amounts of arid sagebrush steppe habitat that extends up in elevation into productive mountains providing crucial habitat for all stages of a sage grouse’s life cycle and habitat for elk and mule deer. The BLM and landowner agreed that changes to the existing grazing plan were definitely needed so I worked closely with them to design three separate grazing systems, one for each ranch, which are linked together by different herds of cattle that graze across the properties. This was a challenging venture that took immense planning and collaboration. Due to my SGI position, coupled with the willingness of the BLM and the landowner, we were able to complete this task in a remarkably short amount of time. The success of the previous two projects has resulted in additional unique collaborative opportunities such as addressing invasive species, namely cheatgrass. One such project involved the local BLM, U.S. Fish and Wildlife Service-Partners for Fish and Wildlife, Wyoming State Land Board, and the local weed and pest agency as partners with SGI. A prescribed grazing plan was fashioned collaboratively by the BLM, the landowner, and myself. The original grazing plan was a four pasture-two herd rotation. We modified that into a four pasture-one herd rest-rotational grazing plan. This modification has allowed us the flexibility to rest one pasture for 15 months in tandem with cheatgrass control. The rested pasture will be rotated between the four pastures and ultimately 2,600 acres will be treated over a three-year period and then again two years after the first treatment. This project will provide a comparison of the effectiveness of herbicide treatment alone versus herbicide treatment coupled with a biological control treatment to reduce cheatgrass in a fairly arid environment. These projects have improved the working relationships between landowners and the BLM opening new avenues to implement projects across large landscapes. Positions like mine provide much needed additional capacity to accomplish vast amounts of rangeland inventories, monitoring, and conservation planning accomplished. These projects are examples of how we can collaboratively improve resources and rangelands across the West.